During her last week in Ahmedabad, Mihika had planned a full Ahmedabad darshan for her mother and friends who were visiting her. I think it was for herself as well; as during the 3 months she was there she saw little of the city’s attractions :). And I joined them in one of the outings which was the night heritage walk organised by House of MG.
We all gathered at the House of MG, where we bought the tickets for the heritage walk (Rs. 200). 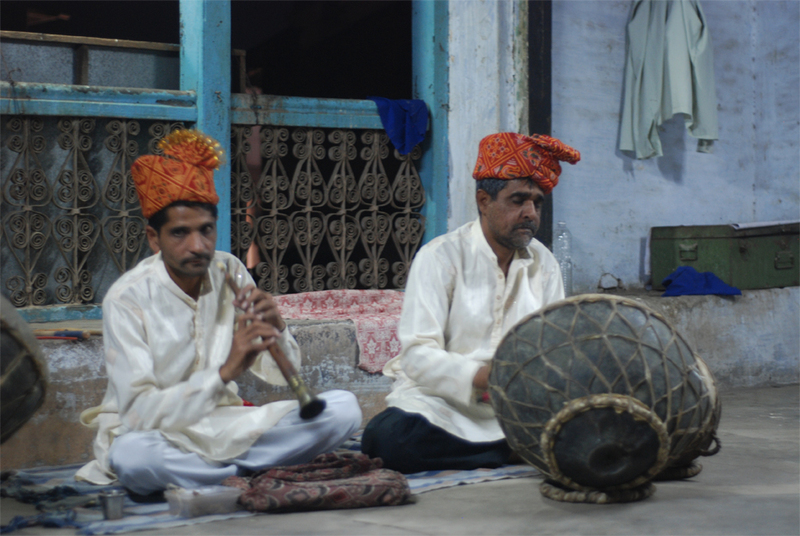 We then moved to the mangaldas ni haveli in a shuttle car where we met our guide and other members on the walk. Our guide Viren bhai started with the history of the haveli – the haveli earlier called Duletia haveli is almost 200 years old. What impressed us first as soon as we saw the haveli from front was the intricate carving on wooden façade and the same intricate and colourful carvings in traditional Gujarati style, inside. We then saw another interesting thing – a water storage facility of more than 100000 litres capacity. Hidden pipes on the roofs feed rain water into the storage tank. The Haveli has recently been renovated and is now a coffee shop and also has a shop showcasing traditional Gujrati handcrafts. Viren bhai then told us how all the houses (or havelis as they should be called) were built according to vastu principles – each had an east-west entry and so all the main road ran north-south. Every home had a verandah (courtyard) with an open ceiling to let in sunlight and have natural air-circulation. One would wonder how these houses stayed up in the face of the earthquake. Viren bhai told us, that the walls of these old houses were 18inch thick (while the new construction is only 9 inch) and after every 9 inch there is a wooden bar and since wood is flexible, it absorbed the shock and there was nearly no damage to these homes. 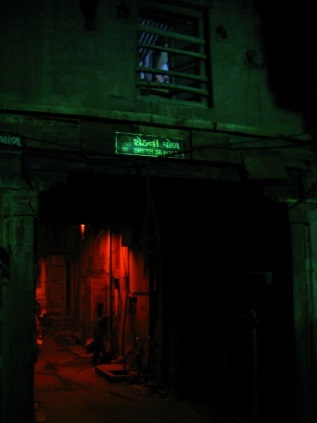 We then moved through the labyrinth of small lanes lined with beautiful havelis on both sides. Ahmedabad was founded by Sultan Ahmed Shah I and therefore the name Ahmed-aabaad. The original planned city (5 ½ sq kms) was a walled city with 16 darwazaas (gates) and approximately 600 pols. A pol is like a closed community which is a walled locality within the walled city. Each pol like patel-pol; sheikh-pol; navi-pol etc had an entrance door and a security cabin on top. What is left now of the structure is mainly the doors and the security cabins. lady built a haveli for her husband – a haveli with 60 rooms that is maintained but unoccupied right now. The bird feeders were another interesting feature. As the city grew there was shortage of space and trees were cut down in the walled city. As a result birds didn’t have a place to go and so the residents made bird feeders. Raised platforms where they put grains and water for the birds. Through the lanes, we finally entered manek chowk, which comes alive with the bustling night market. At the other end of the market is the mausoleum of King Ahmed Shah. On top of the door of the mausoleum, a family has been playing live music at 11pm every night for 600 years. In older days it was a signal for the closing of the gates, but now it’s a tradition they are not willing to let go and also a tribute to the original king. During the end of the music, the drummer’s son came in and the father gave the sticks to his son. It was an act which showed that the son was equally proud and eager to carry on the tradition :). Our guide told us all the facts but what it missed was the personal stories of the people who used to live in these lanes and these huge havelis. Even if the stories were nothing but fables, it would surely have added to the experience. The wonderful shenai and drums music was a fitting end to the walk. The music was beautiful but more than that I was amazed by the fact how the family finds pride and purpose in the tradition. They are not getting paid for it but every night without fail they are there and on Thursday and Fridays they play 5 times. The only regret I have is of not having carried a camera and my bad luck that my phone gave up on me just then L. All the pics I have been borrowed or stolen :). It just means I have to visit those places again, in better light and with a camera! Organised by house of MG; from 10:00 to 11:00pm; Rs 200 per person. You have to reach House of MG by 9:30pm and buy tickets. Prior booking by phone id preferable. The guide leaves you at Manek Chowk and there are no return arrangements. However you can easily find an autorickshaw at the chowk. Yes! I don’t think I would have ever gone alone! It was largely because of my friend’s enthu 🙂 The hotel is really nice and they have recently renovated the haveli very beautifully. 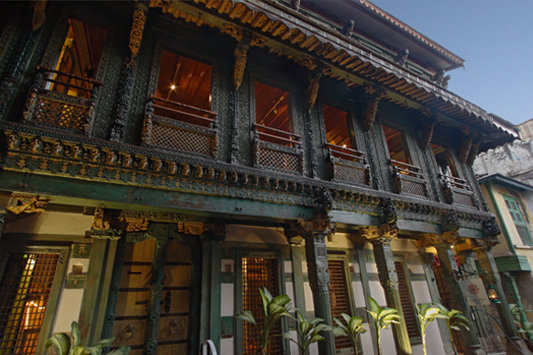 The haveli serves as a cafe and a handicraft store during the day time.